These instructions are for the guidance of all involved in the installation of Light Dome Depressible Rubber Inserts Mk 100A and Round Metal Bases LD2010 which conform to BS.EN1463 Parts 1 & 2, BS.EN13212:2001 and carry identification. They are manufactured under ISO 9001 certification and have CE Accreditation and are classified as R1 & S1. The instructions should be read in conjunction with any legislation currently in force from the Department for Transport and Highways Agency. All Light Dome products are approved for use on all UK and European roads, and are also accepted by the Department of Environment in the Republic of Ireland. Copies of approvals are available on request. The Company accepts no responsibility for any consequences of installation not carried out in accordance with our recommendations. It is the responsibility of the installer to ensure that the road construction and weather conditions are suitable for the installation of the Round Metal Bases and depressible rubber inserts. The spacing and reflected colours of the Depressible Rubber Inserts in Great Britain must be in accordance with Department for Transport regulations. In the Republic of Ireland, with the Department of Environment regulations in force at the time. Round Metal Bases must not be installed within 50mm of any expansion joint. For overseas usage, Light Dome Round Metal Bases and Depressible Rubber Inserts should be positioned and spaced to conform with the existing laws and regulations, where applicable, of that country. Hydraulic powered drilling equipment is the only approved method of installation on public roads in the UK. The drilling equipment unit produces a 165mm cavity in the road to a depth of 38mm. On reaching this depth the drill is raised and the resulting cavity will be to the required tolerances. For Light Dome Rubber Depressible Inserts to give optimum reflective visibility, it is essential that the reflectors be continually above road level, so as to receive and reflect the light of vehicle headlamps. A sunken unit will not reflect and the life of both the insert and reflectors will be reduced. Correct use of a height gauge, which is available from Light Dome if required, will ensure maximum efficiency from the inserts. The Light Dome metal base must be installed so that, with the height gauge resting on the flanges, the ends of the gauge must not be more than 3mm clear of the road surface. 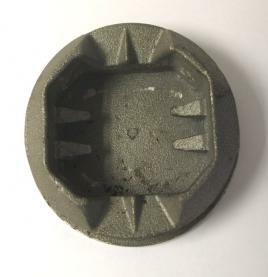 The Depressible Rubber Insert can either be put into the metal base prior to installation or inserted after the metal base has been installed in the road. This is a matter of preference by the installer. Insert one side of the rubber insert into the metal base and ensure the pins are located into the two insert holes. Push the rubber insert under pressure so that the other two location pins can be inserted into it. The insert will spring back so that the locating pins hold the rubber insert firmly. There are no 'frogs' on the underside of the Light Dome Round metal base therefore there is no pre-filling with bitumen required. The drilled-out material and dust must be completely removed from the cavity in the road. In cold or wet weather conditions, the cavity should be heated by flame gun to raise the temperature to a minimum of 5°C before bedding and grouting the metal base. Bitumen*, at the correct pouring temperature typically 170-190ºC (Refer to Suppliers recommendations for correct temperature), and fully agitated, is then poured into the cavity to a depth of approximately 6mm. Immediately place the metal base onto the molten bitumen. The cavity sides between the metal base and the road are topped up with molten bitumen to the level of the road surface. The bitumen is level with the road surface. The metal base is level and aligned in the cavity. The overall height (with the aid of the height gauge). No surplus bitumen has blocked the recess to the Light Dome reflector lenses or eyes. Once the bitumen has cooled, traffic can be resumed over the depressible Light Dome. We do not recommend the re-installation of housings. Insert a suitable tool on one side between the rubber insert and metal base. Lever the rubber insert off the retaining pins of the metal base. Check the metal base for damage, and ensure that the four retaining pins are intact. Clean the inside of the metal base of any dirt which can cause excessive wear on the rubber insert. Ensure that the inside walls, bottom and the retaining pins of the metal base is completely clean. Remove any bitumen or other debris located on the metal base in front of the rubber insert reflector position. Ensure that the rubber insert is properly located in the metal base; pressure by the heel will assist in this operation. The Light Dome range includes many other products. Steve Vine, Commercial Director and Light Dome Manager.